Funky Monkey is sweet strawberry mixed with ripe and creamy banana, with a touch of kiwi. funky monkey is a good powerful fruity flavor. However I did have issues with wicking the coils properly so for that reason I did have to knock one star down. I think it might work better in a different setup so I am gonna try it again later. Love that I finally found a good banana and strawberry mix. The kiwi just adds something so good to it that I didn't even think it would be possible. Kind of reminds me of a fruit smoothie. And has a lot of sweetness and a bit of sourness to it as well. Always been one of my favorite flavors and always will be. This one is seriously to do for. I think everyone should try this one at least once if they like fruity flavor combos. The strawberry and banana is perfect and the tart kiwi ties it all together. The banana really stands out in the Funky Monkey. I highly recommend this one for people who like fruit flavors. I have been vaping this one for about 6 months now. It reminds me of a jamba juice smoothie. I'm absolutely loving this flavor. It's got the perfect fruity blend. I feel like I'm enjoying a smoothie or something. It's so refreshing and I just love how mellow all the flavors are. None of the flavors take over but they are blended perfectly. It's not creamy like most fake fruit smoothies are but this tastes just like pure blended fruit and it's delicious. This has been my all day vape for a long time now. Figured I would write a review. I like this one because it's not too much of anything and has a nice balance of flavors. I will continue to be a long time customer and buy the Funky Monkey flavor. I found this juice around a year or two ago. It is still my favorite. I never seem to get tired of this one. It is the PERFECT fruit flavor. Some companies don't know how to do fruits right but Apollo's fruit flavors are always awesome. this flavor you can really taste all of the elements. Sweet bananas, strawberries and kiwi's. It is very unique and is a great blend of flavors. Love it. Funky monkey is flavor that is very hard to get tired of it. It is sweet and fruity and always taste perfect. This recipe was really perfected! I love this one and always buy it again and again. 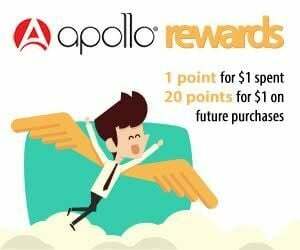 Thanks Apollo!! Ordered on line, took advantage of the summer sale coupon, and the package arrived the day after I placed the order. Can't get better than that! Ahhh, my very 1st love of Apollos FAQ line! It's got banana, no wait - now I taste more strawberry, no, it's got me on a kiwi trip...? It doesn't matter b/c everything about this is delicious! You can vape on it as is, or add a little extra of your fav flavor. I had a friend that added a touch of menthol to it. Not something I would do, but she loved it! And love is the key word here! Love the blend of all kinds of fun flavors that simply *pop* b/c every flavor is the star of the show. For this flavor, I say, "bring on that sweet funk!" I took a bit of a gamble with this as I don't normally go for fruity flavours however, the flavour and quality of those e-liquid was far better than any other eliquid I have used before. The taste is nice and strong however I found it personally a bit too sweet I'd still definitely recommend it to anyone who loves fruity flavours. I have tried other high vg juices from other brands, but this I like the most and would definitely stick to it! It has such a great banana flavour and it produces the best clouds. Delicious, smooth, flavouful. Go for it!